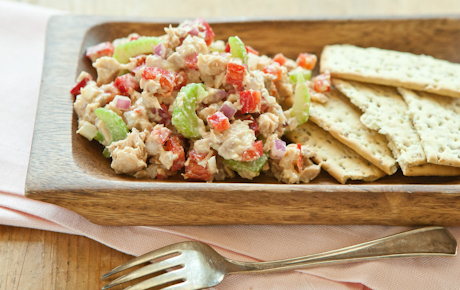 Rich salmon, slightly sweet honey mustard and crunchy vegetables make this fresh take more flavorful than tuna salad. Kids and adults alike will enjoy it on stoneground crackers, multigrain sandwich bread or lettuce leaves. In a large bowl, whisk together honey mustard and yogurt. Add salmon, pepper, celery and red onion and stir gently until combined.